My name is Matt. I am a proud Pole. My Grandfather immigrated to the United States during world war 1. My Grandfather used to say "he left while artillery shells were dropping around him". I am a devout Christian but I definitely need to act like it better. I am a film student whos dream is to make a movie about the Siege of Vienna. 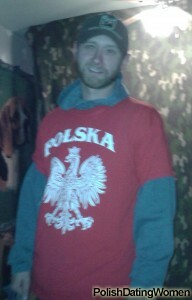 I am knowledgeable about not only Polish history but European. I have cousins in Poland and it is a dream of mine to visit the Carpathians. I am loyal ,honorable, fun loving, silly, funny and love to meet new ppl and experience new things.I love children and cherish having a Polish wife and family. I can speak Polish but not fluently and I am still learning. I am writing a book about Polish pride,social , government and military reform in our Motherland. If you are looking for a man who values our ppl and family please message. POLSKA DUMA! A strong Polish woman who isnt afraid to speak her mind. Adventurous, loyal, who loves the outdoors and wants to make a relationship that will last.